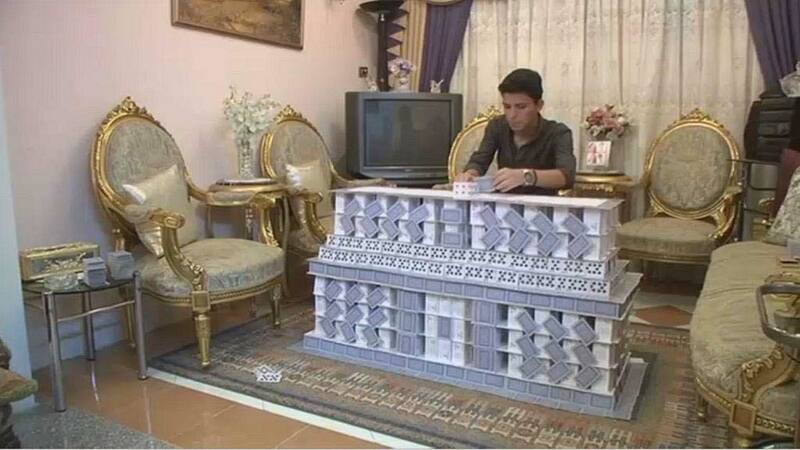 *It takes hours to build, seconds to destroy, Ahmed Hassan Refaie is fixated on making buildings out of playing cards. The Egyptian law student does not just makes card houses; he makes palaces and churches, some of which take days to construct. "I love this, to be honest. I like the idea a lot. I like architectural shapes. I like cards. I like art. So, I tried to find a link between them and this is the link," he said. The Twenty-year-old artist has been pursuing his hobby for 10 years and hopes to win a Guinness World Record something that would bring him one step closer to opening a museum, which he hopes to build out of cards. "The biggest model I made was the 'Church of Losanda', this was made for the child who died in the bombing. It took me 100 hours, because of the details. The small things that were in it were very hard to get right. So, it took me a very long time to do the details," Refaie said. He has reproduced monuments from Capitol Hill in Washington to the renaissance churches of Europe. "I would like to get a Guinness Record. Some people say Guinness is my goal but to me it isn't. To me a Guinness is a step which would enable me to put on a big exhibition. Hopefully, in my 10-year plan, I'd like to build a museum made of cards. I got the idea from a museum in China that is made of cardboard," he added. His largest creation is the "Church of Losanda" – named after a child killed in the recent bombings that targeted Christians in Egypt, it took him 100 hours to build.